Designed for safe transport to and from the shower. Anodized, non-corrosive aluminum frame construction will not rust. Comfortable nylon backrest removes for easy cleaning. Cushioned armrests enhance user comfort. 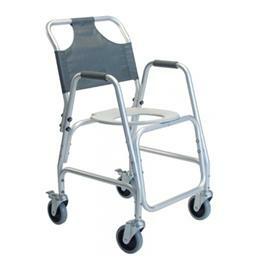 5" swivel casters with rear wheel safety locks facilitate maneuverability in tight spaces. Rolls easily over most toilets. Allows complete access to body for easy cleaning during bathing. Limited lifetime warranty.